The Freedom Road Socialist Organization, based in the United States, sent a message of solidarity, greeting the Popular Front for the Liberation of Palestine on its 41st anniversary, on December 11, 2008. The FRSO message expressed solidarity with the PFLP, and particularly expressed support for the freedom of Comrade Leader General Secretary Ahmad Sa’adat, imprisoned in Zionist jails. We send our warmest greeting on the occasion of the 41st anniversary of the founding of the PFLP, and we salute the courage that has been demonstrated by the leaders and members of your organization. The heroic efforts of the PFLP stands as an example to revolutionaries everywhere. 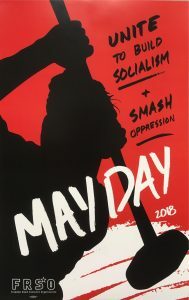 Your will to fight and determination to win serves to inspire all who want to end oppression and exploitation. We are certain the PFLP will realize still more successes in the period that lies ahead. We highly value the militant friendship between our organizations. We will continue our work to free your General Secretary Ahmad Sa’adat and to end the occupation of all of Palestine. And we will continue to work for a world that is free of imperialism, Zionism and reaction of every kind. Long live the struggle of the Palestinian people! Palestine will be free! Long live the Popular Front for the Liberation of Palestine! Next post ¡Victoria a los Obreros de Republic Window and Door!